Today, in the most ironic timing ever, the film United Passions is being released in the United States. Almost entirely funded by FIFA to the tune of more than $30 million (!!! ), it dramatises the early days of soccer’s governing body and the introduction of the World Cup. Without the corruption. So it’s a short film. It’s also got a cast which, if not stellar, at least contains household names. Such as Tim Roth, who plays the hero of the piece, Sepp Blatter — this is a FIFA film, after all. Roth is joined in this frolic by Sam Neill and Gerard Depardieu. Now, some say it’s rotten luck the flick is being released a week after a conga line of FIFA officials was marched in front of the FBI’s welcoming committee. But given most Americans didn’t even know what football was until their own federal officers started bailing up the bad guys, releasing the film now, at the height of all this publicity, could be a genius marketing coup. FIFA may even make a profit on it. Like it does on everything. Meanwhile, Sepp Blatter has just tweeted this. And no, it’s not a parody account. If there’s one person having a more bizarre week than Blatter, it’s his old crony Jack Warner. The former FIFA Vice President was in custody in Trinidad when he complained of exhaustion and was whisked off to hospital by ambulance, too ill to speak to reporters. This was him a few hours later. Then he released an eight-minute video on ‘Warner TV’ in which he thanked people for their kind wishes and blank cheques. I’m not making this stuff up. He seriously said ‘blank cheques’. In that video, he also used an article from satirical news provider The Onion, headlined “FIFA Frantically Announces 2015 Summer World Cup In The United States”, in his defence. The article was a total piss-take but Jack missed the humour. “If the FIFA is so bad, why is it the USA wants to keep the FIFA World Cup?” he demanded. Which prompted one observer to note that Warner may just be too stupid to pull off a corruption plot. 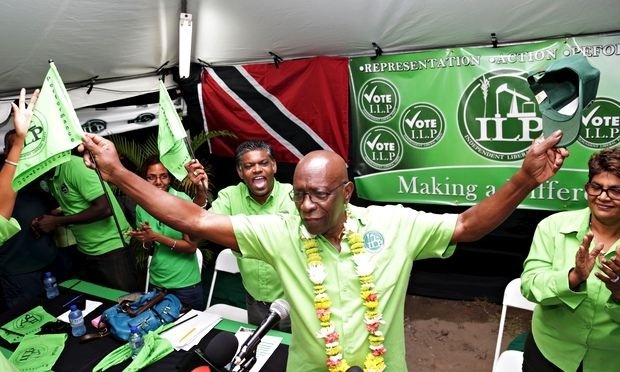 Now, Jack is claiming Sepp Blatter influenced Trinidad’s national election in 2010! And, though fearful for his life, he’s promising to sing like a canary. Strap yourself in, folks. This’ll be fun. Changing codes now, last weekend AFL legend and former Aussie of the Year Adam Goodes scored a goal. It being the indigenous round and Goodes being an indigenous bloke, he celebrated by doing an indigenous war cry. From the response, you’d think he’d farted the national anthem. Big burly commentary blokes and former players claimed the move was aggressive and made them feel uncomfortable. “Probably best not to do it,” cautioned one. Collingwood President Eddie McGuire, who once suggested Goodes could be used to promote the King Kong musical, dismissed it as a ‘made-up dance’. 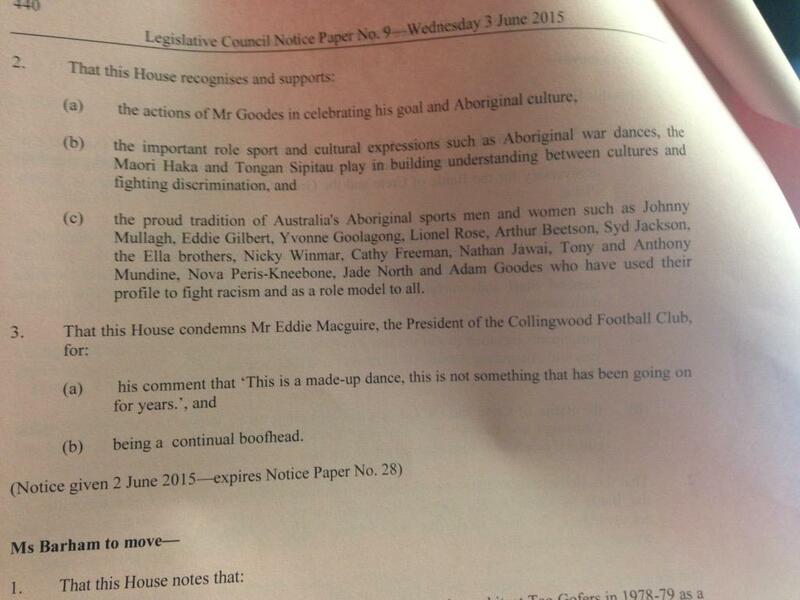 For his efforts, the NSW Parliament passed a motion condemning McGuire for ‘being a continual boofhead’. A rare moment of political consensus and I just love that Eddie’s preserved forever in our parliamentary record in this way. Among Goodes’ many supporters was his mate Michael O’Loughlin, who put the whole episode in its proper context. Over in England, a man was escorted away by police after becoming a little too, um, enthusiastic during a naked bike ride. The World Naked Bike Ride is an “annual demonstration that draws attention to the absurdity of oil and gas dependency and celebrates the potential of cycling and the human body.” Just not the full potential. 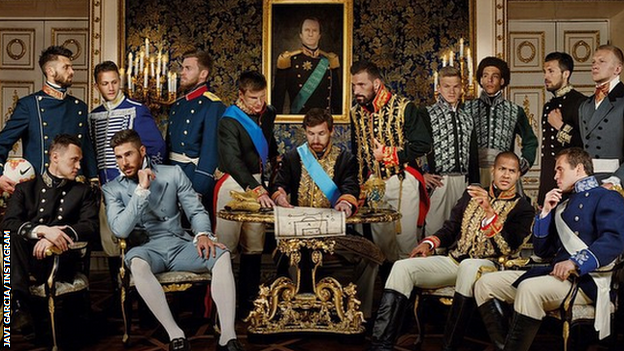 And finally, we leave you with a team photo with a difference, of Zenit St Petersburg football players dressed in traditional Russian garb after winning their domestic league competition. A classy note to end on. I know what you mean, Joey. If you put this in a script, people would say it’s too far-fetched! This is Friday afternoon gold! PS – if I knew where the hell I’d filed them, I’d have to post one of those pics of me from 10 years ago when I cycled (semi) naked around Bondi in the name of “art”. Or sport. Can’t remember now. Classy but!